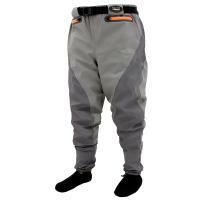 Waders are standard equipment for anglers walking or wading into a stream, lake or other bodies of water. Traditionally waders are made of rubber or neoprene. 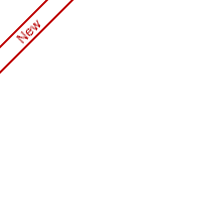 With advances in technology, many waders today are made of synthetic materials such as nylon. Waders not made of rubber or neoprene are typically described as "breathable" waders. 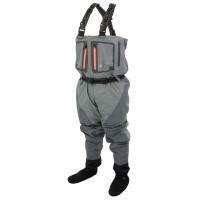 Rubber waders are still available, and neoprene waders are used mostly for cold water wading. Hip boots, or "hippers" are waders covering the foot up to the hip, and you need a pair of hip boots. Waist-high waders are an integral pair of waders, coming up to your waist, and are used for lower waters where you will not be wading deeper than your waist. 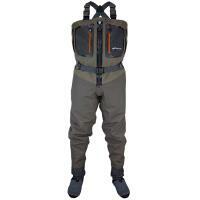 Chest high waders are traditional waders, similar in style to bibs, and have shoulder straps to hold them up. Stockingfoot waders have a bootie connected to the wader and are typically made of neoprene. You must have wading boots with stockingfoot waders. Bootfoot waders have the boot integrated into the waders. The boot can be insulated, for cold water wading, or uninsulated. Cleated bootfoot waders are a general boot with rubber cleats permanently attached to the bottom. Felt bootfoot waders are designed for wading on slippery stream surfaces like algae, where cleats or studs would be unable to grip. Studded bootfoot waders provide the maximum traction, especially on stone-bottom streams. Studded bootfoot waders can come with permanent or removable studs on the bottom of the boot. 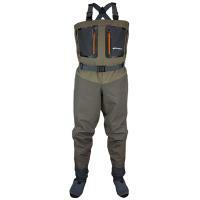 Top brands of waders at FishUSA include Simms, Pro Line, Frogg Toggs, Hodgman, Chota Outdoor Gear, and Redington.